Propofol (2,6-diisopropylphenol) is a synthetic intravenous anaesthetic which is an oil at room temperature and is supplied as a 1% emulsion (in 10% soyabean oil, 2.25% glycerol, and 1.2% purified egg phosphatide). ■■ Propofol is useful in the induction and maintenance of general anaesthesia as part of inpatient or outpatient surgery in adults and children over 3 years of age. ■■ The exact mechanism of action is unclear but is probably related to its ability to enhance GABA-mediated synaptic inhibition. · Propofol is known to cause hypotension, bradycardia, and even cardiac arrest. · In children, it may induce choreiform movements, rigidity, and ataxia if the usual dose is exceeded. · Some paediatric cases have demonstrated high morbidity associated with lipaemic serum and elevated levels of very-low-density lipoproteins and triglycerides. Whether this has any relationship to the lipid carrier of propofol is not clear. · Several paediatric case reports of “propofol infusion syndrome” following prolonged propofol use for inten-sive care sedation have been described. The syndrome, which may be fatal, is characterised by metabolic acidosis, bradyarrhythmias, rhabdomyolysis, hyperka-laemia, hyperlipaemia, acute renal failure, massive keto-nuria, elevated liver enzymes, fatty liver and myocardial failure. Biochemical findings are consistent with impaired fatty-acid oxidation; the resultant lack of substrates and the build-up of intermediaries in the metabolism of long-chain, medium-chain, and short-chain fatty acids could theoretically account for the clinical features present. Although children are said to be more likely to develop this condition, adults have also been affected. Fatalities have occurred in both groups. · Fever has been associated with prolonged propofol infu-sion in children. · Anaphylactic reactions have occurred during propofol administration. 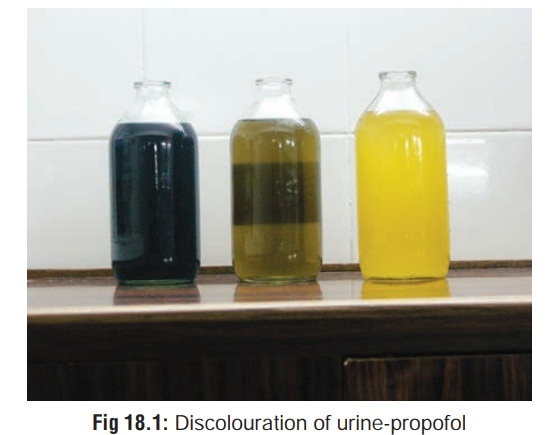 · Discoloured urine (olive green, rusty brown, tea-coloured) has been reported in several paediatric exposures to prolonged propofol infusions used for intensive care sedation (Fig 18.1). · Complex external ophthalmoplegia has been reported in patients recovering from propofol anaesthesia. –– Imbalance between cortical and subcortical effects with propofol is involved with the symptoms observed. Propofol is susceptible to contamination with micro-organisms (S.aureus, E.coli, P.aeruginosa, C.albicans, etc. ), and cases have been recorded where bacteraemia has resulted from its use in patients. It is recommended that propofol ampoules should be wiped with alcohol before use, and strict aseptic techniques should be followed when preparing infusions. · Monitor arterial blood gases in all patients following a significant exposure. · Monitor ABGs routinely in children receiving propofol infusions for a prolonged period or in patients as indi-cated. · Obtain baseline electrolyte levels and monitor fluid status. · Monitor ECG and blood pressure in patients following overdose or prolonged exposure. · Establish respiration and create an artificial airway if necessary. Check adequacy of tidal volume. · Aggressively treat and evaluate coma. Intubate and ventilate as needed. · Physostigmine may help in central anticholinergic syndrome (especially if it is asociated with hypotension and arrhythmias), but must be used with caution. · Atropine is useful in bradycardia. For ventricular arrhythmias, obtain an ECG, institute continuous cardiac monitoring and administer oxygen. Evaluate for hypoxia, acidosis, and electrolyte disorders (particularly hypokalaemia, hypocalcaemia, and hypomagnesaemia). Lignocaine and amiodarone are generally first line agents for stable monomorphic ventricular tachycardia, particularly in patients with underlying impaired cardiac function. Sotalol is an alternative for stable monomor-phic ventricular tachycardia. Unstable rhythms require cardioversion. · If there is evidence of metabolic acidosis, with a pH of less than 7.1 administer sodium bicarbonate at 1 to 2 mEq/kg every 1 to 2 hours. Repeat ABGs to evaluate response. · For rhabdomyolysis, early aggressive fluid replacement is the mainstay of therapy and may help prevent renal insufficiency. Diuretics such as mannitol or furosemide may be needed to maintain urine output. Urinary alka-linisation is NOT routinely recommended.